The dust within this troff is after a major clean-up by the tenent of this building. The dust is from packaging "potato flakes" & refered to as "potato dust"
All the electrical equipment in the area was covered & filled with this. Could this be explosive like grain dust? I hear the odd time of grain plants having fires from gain dust but never any potato plants going up in flames. Virtually all food dusts will explode. They're never too far away from carbon dust. Food storage elevators explode all of the time. It's the dust and some static that does it. The plant would flunk my hygiene test. Just an update on this. The processing of the product was ceased, and all the equipment was removed! 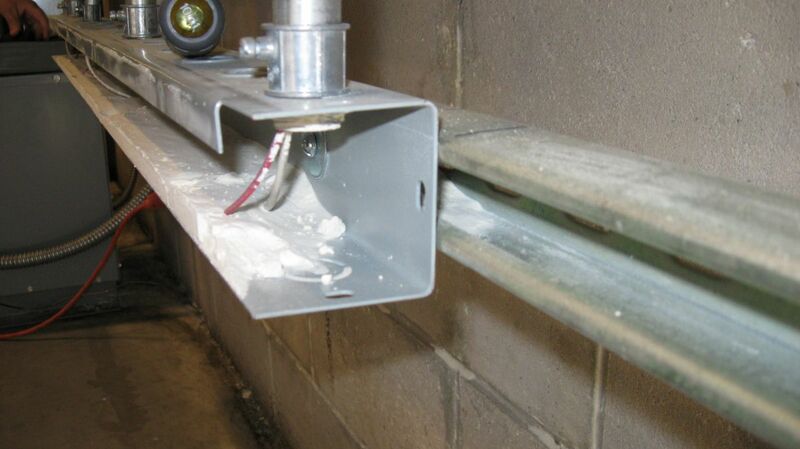 There was an extensive clean-up of the dust that migrated thru various conduits into other sections of the structure.